i traveled through ireland and northern ireland almost entirely by bicycle, however i did not have a camera with me, so all the irish shots are from traveling partners. one of the best shots ever. 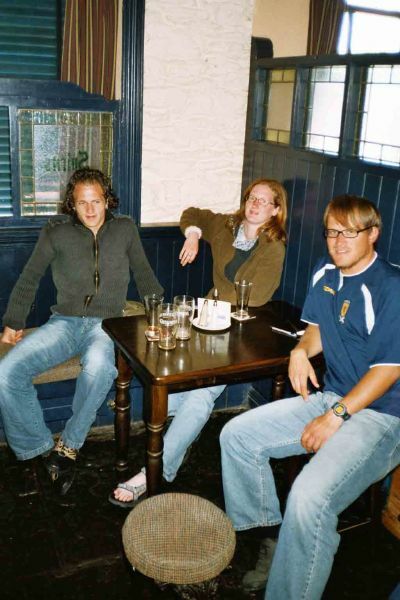 sent to me by the guy sitting next to me, rob from the netherlands, here we are drinking guinness in a pub/hardware store in dingle, ireland. 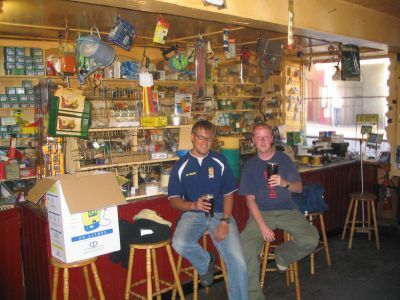 half the pub sold hardware supplies, and the other half served beer. this was a common occurence in ireland. just before this photo was taken, the guy in front of us didn't order a guinness, he ordered a padlock - true story. the first of two photos sent to me by my german buddy chris. here i am in a pub in waterville on the famous "ring of kerry." we hung out here everyday. that's stefan and sarah behind me, both germans. 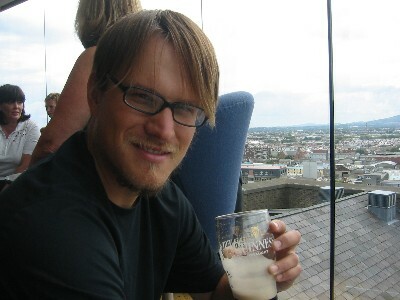 lots of germans in ireland. because of the people i met in pete's place hostel i stayed in sleepy waterville for one week - i was simply having too much fun to leave. here we are outside the hostel; stefan and sarah again, and then pete (the irish owner) with the bald head sitting at the table with petter from switzerland crouching and indicating to the camera. ireland is a pretty small place so i often ran into some of the same people over and over. 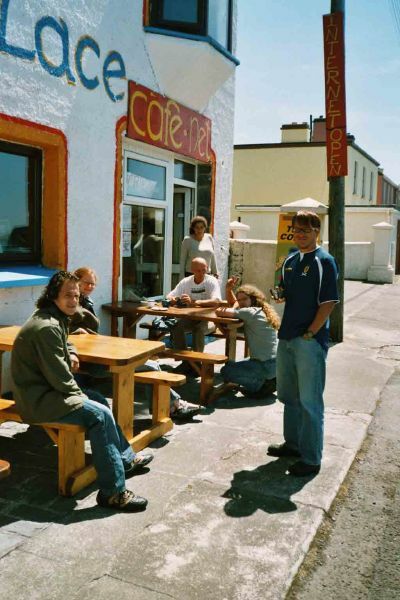 i opened up the door to a pub in doolin one day and standing right inside was rob from the netherlands. he pulled me over to the table where his two buddies from home were sitting. 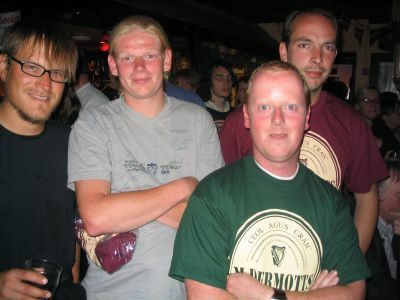 we drank some beers and listened to the amazing live music in mcdermott's pub. 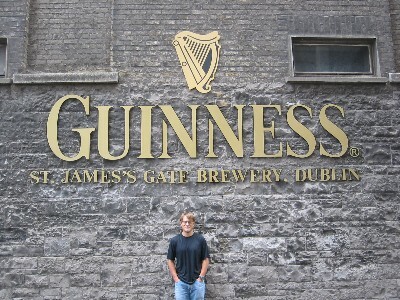 ok, i know that the guinness brewery is around here somewhere! 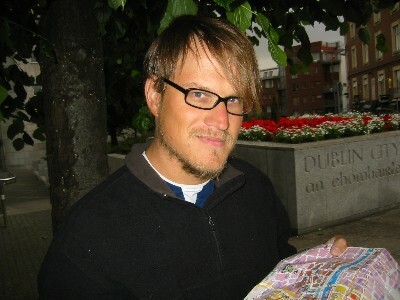 me looking on a map of dublin for the factory that produces god's favorite beer. so did stephanie! 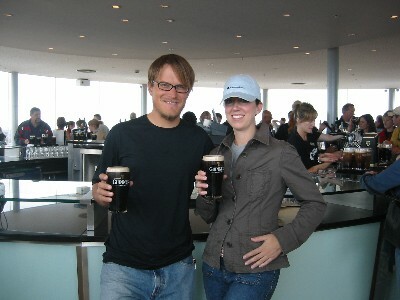 her and i at the end of the tour of the guinness brewery in dublin drinking the "best pint you'll ever have." 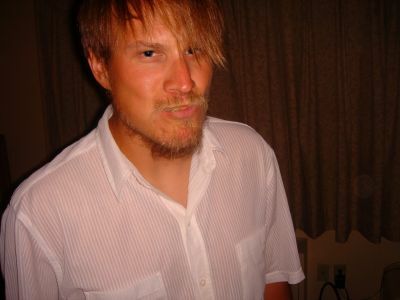 in july 2004, one of my best friends back home got married and he asked me to come to the wedding in new mexico. i flew to the states from paris with a french girl who was also invited to the wedding. we got to denver where we rented a car and then drove to new mexico for the wedding. 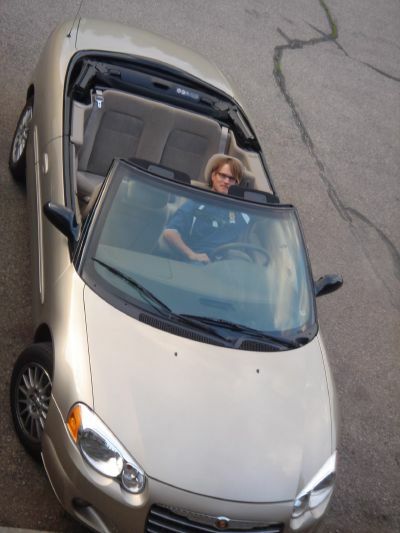 here i am in the convertible. 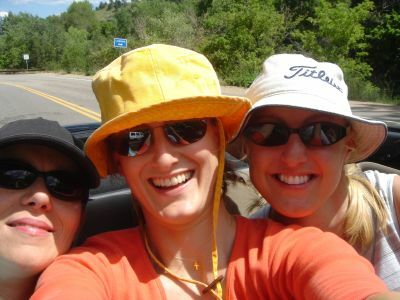 claire, the french girl, jessica, the fiancee, and one of my great friends from colorado, karin, all riding in the back of my convertible through the colorodan countryside. 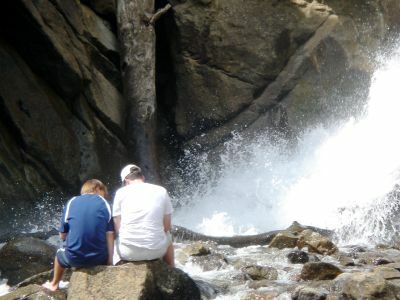 jason shows me the wedding ring at the base of boulder falls in boulder, colorado. 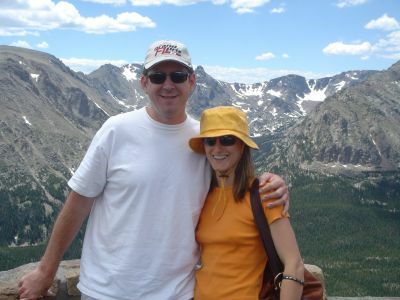 jason and his fiancee jessica in rocky mountain national park, colorado. 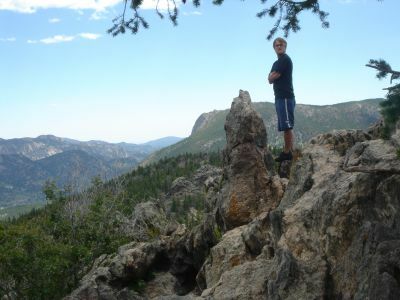 me in rocky mountain national park, colorado. 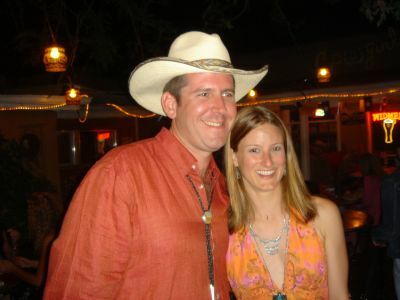 i was very glad to be able to visit with my niece who lives in new mexico where jason's wedding was. 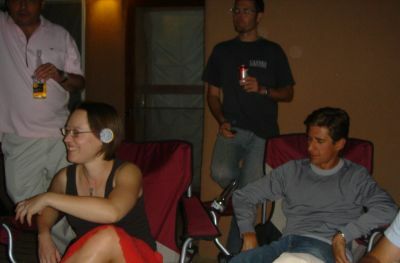 here is rachel sitting next to jason's future brother-in-law, bobby. the happy couple at the rehearsal dinner, dressed in typical southwestern american outfits. i drank far too much with all of jason's friends who had flown in from all over the globe, so we ended up playing a drunk-person-only game called "bite the bag." someone finds a paper bag, casts it onto the floor, and then each contestant must pick it up off the ground with their teeth - no hands allowed (until you retrieve it from the floor.) you take a bite of the bag and throw the rest on the floor. the game is over when the bag is gone. here jason's friend nevin rips off a hunk of bag. 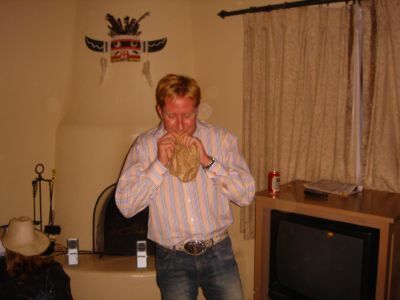 dave stoops low for the bag. halfway through the game, the guys told me about a rule in which the contestant can eat the entire remaining bag for the win. i wanted to impress these guys so i went for it. i puked it all up about two hours later but retired as a bag-biting legend.